Until the fire of 1742, there had been two churches in Stony Stratford which had bells. St Marys had six, but these were all destroyed in the fire. In 1714 St Giles had five bells which all escaped damage. The body of the church was enlarged and rebuilt in 1776 and the parishioners eventually decided to have the bells recast. The bells which are currently in the tower of St Mary and St Giles were originally intended for another church. The people of Oakridge in Gloucestershire found in 1838 that they could not afford the bells they had ordered for their new church from John Taylor at Oxford. The new church, completed between 1835-1837, has a tower large enough to take a ring of bells, yet it contains only a solitary small bell. Surviving correspondence in the Oakridge parish records, which comprises 12 letters from John Taylor of Oxford (the bellfounder) to the Reverend Thomas Keble, who was the vicar from 1827 to 1873, reveals an interesting story. Keble submitted an enquiry to John Taylor about some bells for their new church, who responded with the suggestion that the church tower could carry a ring of six bells. Keble must have been concerned at the cost as reflected in the ensuing correspondence. Although Taylor hadnt secured a contract, he actually cast a peal of six bells for Oakridge. Apparently, with Kebles encouragement, Taylor sought an alternative buyer for the bells. Around the same time, the parishioners at Stony Stratford asked Taylor to recast their old bells into a similar peal as the Oakridge bells, and they wanted this completed for Queen Victoria's Coronation. And so the Oakridge bells were hung in the tower at Stony Stratford. They were opened on June 20th 1838 with a competition for prize ringing. 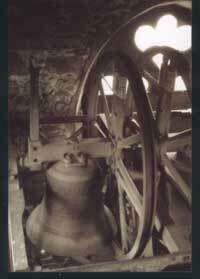 A picture of one of the bells in the tower - circa 1960. Click on picture to hear the bells ring. The bells were rehung in 1893, when the old bell frame was partially reconstructed. In 1923 two more bells were added to give a ring of eight. These bells were also cast by Taylors, and they were hung in a separate frame above the others. There is also a set of handbells owned by the church, which are kept at the school of St Mary and St Giles. They are used by a group of handbell ringers who meet regularly. They are also sometimes used to teach the children about music. 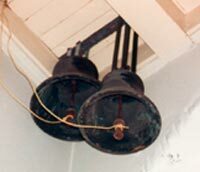 Two bells from St Mary's were hung in the Church when the parishes of St Mary and St Giles merged. Although no longer in use, they can still be seen upon entering the church.